She rummaged around. “I was going to tell you what books I’ve been reading.” She picked up a piece of paper and checked a list. “You’re on a Jules Verne kick,” I said louder. “I ought to,” she nodded, as if I had suggested she do something. She showed me a story she had written. It was nearly two pages, typed. She wanted to have it published in The Columbian. It was about when she and her husband, Pat, lived in Boston. He came home from work and she was eager for him to drive her to see the surf. It was stormy and the waves were big. Their car was small. It took them a long time to get home because trees blocked the streets and water covered the low areas. Near the end, she wrote of an account of how a man had bought a new barometer. It was stuck on “hurricane” so he took it back to the store to complain. When he got home again his house was gone. The storm they trudged through came to be known as The Great Hurricane of 1938. I handed the papers back to her. “How have you been?” I asked. The muses are handwritten in a small, thick book with blank, lined pages. Another page has a list of songs such as Amazing Grace, My Wild Irish Rose and Winter Wonderland. Another page has a list of fairy tale themes such as “Old women are usually wicked witches.” Another page has all the U.S. Supreme Court justices. I noted the time and said I have to go. I gathered my things. I moved the portable potty to give her a sideways hug. I put the low wooden stool back under the wastebasket. I stooped down so she could see my face. I smiled, blew her a kiss and waved goodbye. She grinned and blinked her eyes. Or the crashing surf on the desolate beach. The tranquil reflection in the aftermath. Days when assurance beats the proud drum. Nights when foreboding sinks into despair. 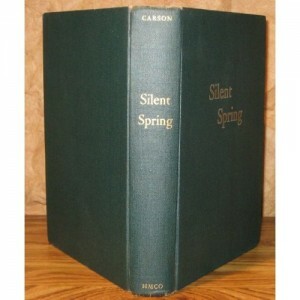 ILLUSTRATION: Silent Spring by Rachel Carson, 1962 Houghton Mifflin Company Boston/Photo courtesy Amazon.com. Meet Josephine in Chapter 1 here.